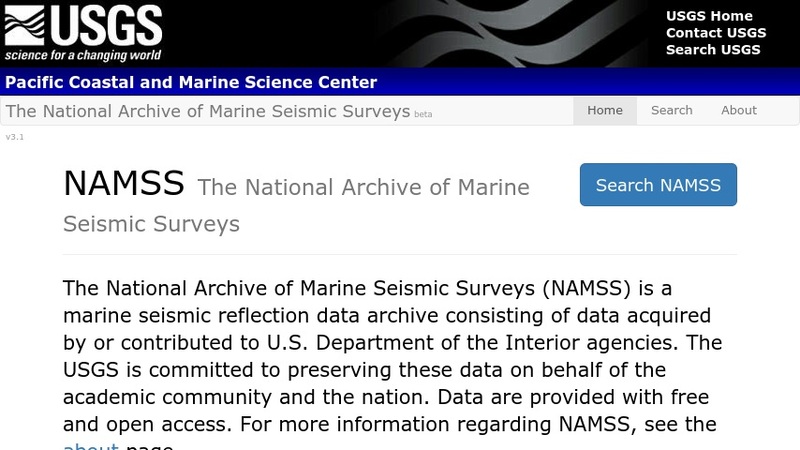 The National Archive of Marine Seismic Surveys (NAMSS) is a collection of marine seismic reflection profile data acquired originally for purposes of oil and gas exploration and development. Although the commercial value of these data has diminished due to technological advances and restrictions on offshore development, the value to current and future scientific endeavors continues to be very high. The collection can be searched by region using a downloadable Google Earth coverage (kmz file) or a series of interactive maps, and downloaded as printable files (PDFs) or as a selection of other files and geospatial coverages. It can also be browsed as a series of tables by region, contributor, year, or availability.